Create a handheld time paradox in Metal Gear Solid: Snake Eater 3D. During my playtime of Metar Gear Solid: Snake Eater 3D at E3, I didn't notice many differences between the handheld version of the title and the PS2 version released years ago. Snake is still sneaky, he's still in the jungle, and he still loves eating creatures from the wilderness. Metal Gear's controls have always been a little bit of a bear to get hang of at first, and the same was true for me when I started Snake Eater 3D. You use the face buttons to move the camera, the analog stick to move, and the directional pad to perform certain actions such as making Snake crouch, go prone, etc. Aiming and attacking is handled with the triggers. Once I figured things out, the experience was remarkably similar to regular old Snake Eater (non-3D version). To my knowledge, the same exact levels and areas have been implanted into the 3DS cartridge. You'll have to make your way past those docile alligators in the swamp, hide in tree trunks, and shoot down bee hives to scare away guards allergic to stings. Which is great, except one aspect of the controls gave me a hint that not everything will be hunky dory. When I had incapacitated a guard, I went to drag his body around which required me to hold in the d-pad and also use the analog stick both on the same side of the 3DS. It was very "claw" like, for those that have played Monster Hunter, referring to the worst hand-cramp in gaming history. Hopefully I was just missing something and one hand won't be required to do so much at one time. The graphics are about the same too, though without a side-by-side comparison it's hard to tell if things have been smoothed out on the 3DS. Animations were a little choppy, but they may not be in the final version. As with all 3DS ports, the big differences come in with the handheld's touchscreen and other associated abilities. Camouflage, food, weapons, and items can all be easily used or swapped in and out by tapping buttons on the touchscreen. You can also see Snake's status without having to open a menu, which is handy when leeches are covering your body and you don't have a clue. Unfortunately, switching out camouflage wasn't implemented in my demo. 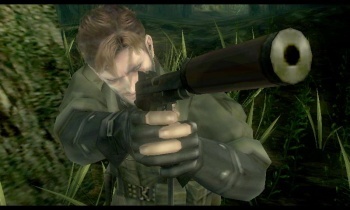 I would expect Konami to include some sort of secret camo patterns as it did in Metal Gear Solid 3: Subsistence. If we're lucky, maybe Snake will wear Kirby's pink or Mario's mustache. A Konami representative did tell me about a feature called Photo Camo that'll allow players to take pictures from the real world and use them as a camo pattern, so look forward to more unique 3DS features like that. Metal Gear Solid: Snake Eater 3D is expected for release in late 2011.